Its the end of the season! MY LOVEEEEEE!!!! 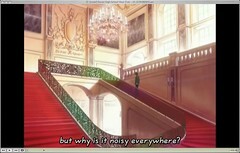 Comedy, High School, Great Animation, BONES studio, drama, and a storyline that never cease to keep you interested. Do any of those interest you? If it does then this is the anime for you. There is always comedy around every corner. 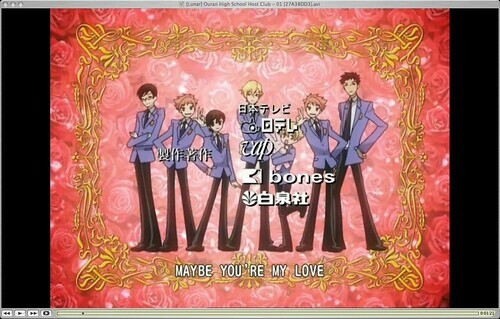 Tamaki is an adorable prince like fool, Kyoya is the serious calculative bestfriend, the Hitachin brothers are the “evil” twins that live to torment the prince of the club, Mori and Honey are relatives as well as the seniors in the group and you have the main lead who plays the role of a girl in guys clothes, literally – Haruhi. Comedy is probably the word you will use to describe this anime. It starts of strong with comedy and a fairy tale like feel to it with halls decked in a pastel pink and teachers are never seen even though it is a school. 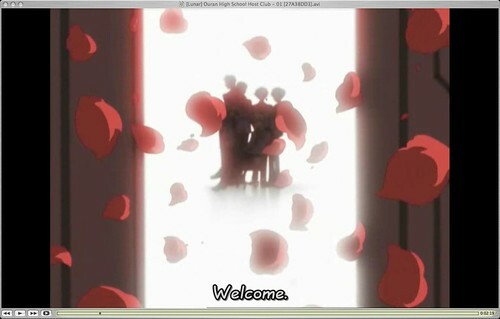 You are invited into the world of Ouran from the moment you listen to the chirpy and upbeat music “Sakura Kiss”. 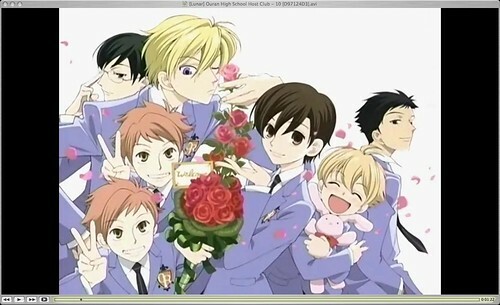 Every time i ask a person if they have seen Ouran 80% reply me with this.. “Kiss, Kiss, fall in love!”(Lyrics from the opening song) Alright, sounds corny, sounds like a typical shoujo love story, but it is not, actually, romance is not even the main focus of this anime. There are hints of it, but the plot does not revolve around the love between characters. 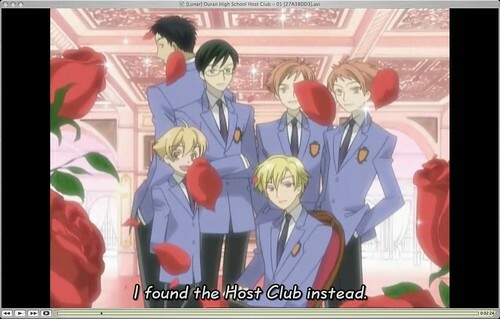 Basically, the whole anime revolves around the main characters and their lives as hosts and a dip into their past as to how they ended up joining the host club and what will happen from now on. Each episode can be seen as being an individual episode with no link to the previous one except for the last 2 episodes on the school festival. You get a glimpse into their pasts, introduced to their families, an you meet many new characters that never cease to entertain you. Each episode is like a small tablet of happiness. It is hard to start of so strongly and yet be able to maintain the level of quality through the whole series. Except for many one episode that i am not too fond of (the Alice in Wonderland ep). Other than that, the anime is of high quality, both animation wise as well as plot wise. The story ends with you wanting more and the lives of the characters going on. It is not a cliff hanger, but there is space for a continuation, though i highly doubt there would be one. You are left with a warm and fuzzy feeling and a smile on your face for days. To the male viewers. 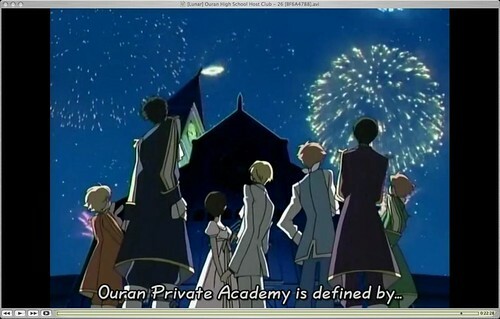 This is a reverse harem anime plus the main female dresses up as a male and appears like a male 99 percent of the time. As such, the male population might not be that interested in this anime. This is probably the only anime that i actually listen to the entire soundtrack both lyrical and non lyrical tracks. You are brought back and forth between so many states of emotions from happy, to bittersweetness, to being relax, to wanting to jump around. The soundtrack is filled with both pop songs as well as ochestra music. It is my all time favourite. And the rewatching value is over the roof for this anime. I never get sick of the characters, you end up feeling like they are your pals.